Hutchinson will compete alongside Australian Josh Brookes for the Milwaukee Yamaha Superbike Team. 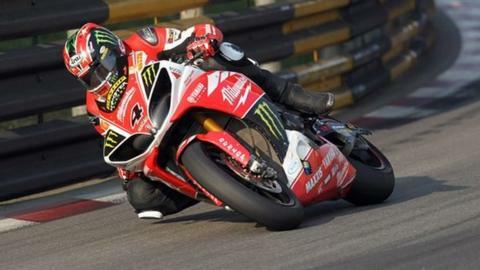 Ian Hutchinson is looking to add to his tally of eight Isle of Man TT wins in June despite the fact his leg may "never be 100% normal". The Yorkshire racer, who became the first rider to win all five solo TT races in the same year in 2010, will race for Milwaukee Yamaha. The 34-year-old has undergone 29 operations in the last three years following a crash at Silverstone. He said: "My leg doesn't feel 100% normal - I don't think it ever will." Hutchinson made a remarkable road-racing return in November . "I didn't go to Macau and think 'no matter what, I'm going to win' but I worked hard throughout the year with my frame on. "Everything went right on race day and we came away with the win, which was brilliant after three years of no real racing." The racer from Bingley has confirmed his entry in all three international road racing events on his specially-modified machine. "It is still a complicated set-up on the bike with a right-hand gear shift and thumb-back break, but it feels pretty natural now. "I would be happy if I won one TT - every win here is special. "To win five in a week was special but it was four years ago now. Maybe it will get matched now there are seven solo races but I am very proud of that achievement."